modern comfort. For those who are looking for the real traditional flavors of Puglia and for lovers of the countryside and the sea. 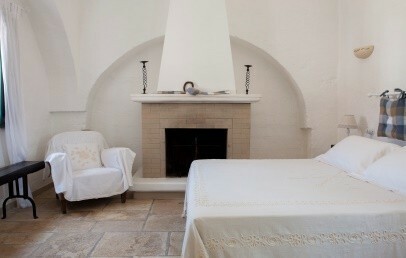 La Masseria Il Frantoio, once owned by a noble family, is located in the countryside of Ostuni, in the heart of Puglia. Today is the beating heart of a 72 hectares farm, known for the production of 4 different types of extra virgin and organic olive oil Dop and a big part of the land is used for the cultivation of olive trees typical of this area. The white Masseria Il Frantoio welcomes its guests with a pine trees avenue of, which extends to the inner courtyard, overlooked by a bloom Italian garden, where is an peacocks aviary and a fragrant lemon, orange, mandarin and cedar citrus plantation. The vegetable garden is located behind the dining room, also fragrant thanks to the traditional herbs cultivation. 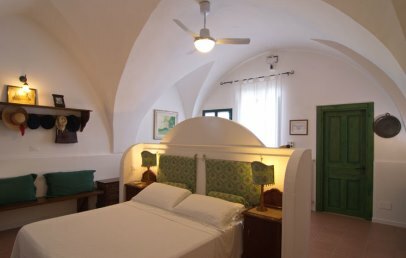 The 16 rooms in the Masseria Il Frantoio were obtained in the nineteen-century part of the structure; all with high ceilings and windows are carefully furnished with the nineteenth-century furniture, beds in wrought iron or wood, original floors: they are cool in summer and warm in winter. All equipped with private bathroom and heating, the rooms have been built trying to preserve at best the original spaces, so doing that works is less invasive as possible. A dining room with stone vaults or, during the summer months, the courtyard of the Masseria Il Frantoio invites their guests to enjoy a typical, delicious meal. To prepare local and regional dishes, the chef uses fresh farm products that will delight the palates with their goodness and simplicity. The menus for dinner, every day a new surprise, have 4-6 courses for a cost starting from € 40 per person. Breakfast is an important moment of the day, and is carefully control: here you can enjoy many homemade products such as biscuits, cakes, sweet juices and jams, taking back the guests to the ancient and authentic flavours of the past. The farm provides a lovely saltwater pool, a comfortable reading and a TV room, and whoever wants to enjoy the sea wonders can rent a boat with skipper and discover the secrets of the coast. 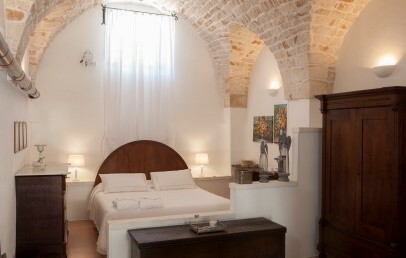 Furthermore, the Masseria offers to its guest free Wi-Fi, mountain bikes and a farm tour by veteran car. For golf lovers, the San Domenico Golf Club is only 15 km away. 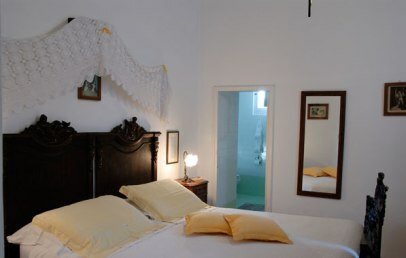 Simple and elegant double room in traditional style and characterized by high ceiling, wrought-iron beds, original floor and delicate paint tones. The private bathroom is equipped with shower and hairdryer. From the windows a relaxing view of the garden. 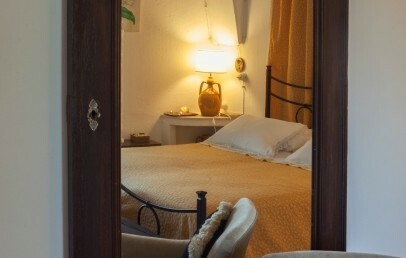 Comfortable double rooms (for 2 or 3 people) elegant furnished with wrought-iron beds and original floor. 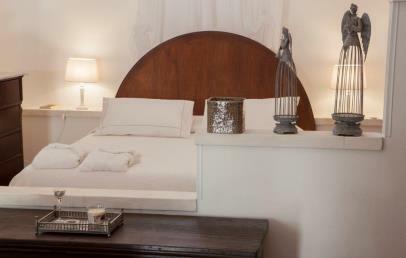 The Superior rooms are characterized by an ancient and evocative atmosphere for an unforgettable stay. The en-suite bathroom is equipped with shower, hairdryer, bathrobe and complimentary toiletries included. Some rooms have a beautiful garden view or face the private courtyard. The Privilege rooms are the largest of the hotel and can houses 2 or 3 guests. They features a charming atmosphere and are unique. The Privilege rooms can have a beautiful garden view, a private little terrace or a private courtyard or can feature a Jacuzzi tub or kitchenette. The en-suite bathroom provides shower, hairdryer and olive oil complimentary toiletries.